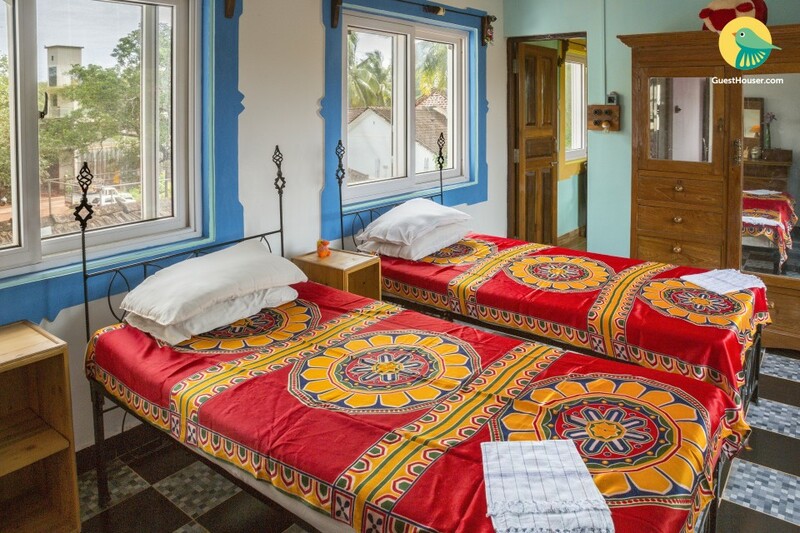 Located on the Calangute-Baga road, this is an offering of a well-appointed room for two guests at a pocket-friendly price. 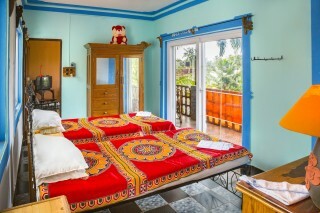 The property has a shared pool for you to take a refreshing dip or lounge around by the pool with your travel companion. A kitchen adds utilitarian value. Your space The compound of the property has a mosaic-tiled floor and ample plants and shrubbery, creating a lovely tropical feel. You can relax on the bench in the compound with your favourite book and enjoy green outdoor space. 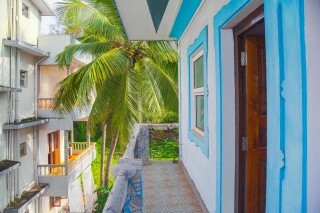 The balcony is also an ideal spot to get some fresh air. The living area with wood-panelled flooring is furnished with a glass-topped centre table and comfortable sofas. A TV in the space ensures you don’t miss out on your favourite TV shows. A small dining space, with a refrigerator and cook-top, has a table and a couple of chairs for you to enjoy your meals. Colourful stained glass windows let in ample natural light here. 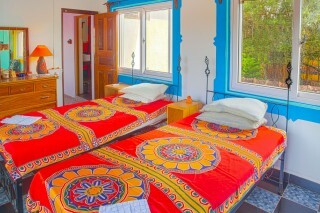 The room is well-appointed and comfortable. 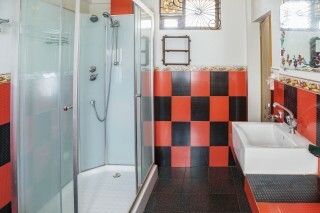 It is furnished with a couple of single wrought iron beds, side tables, a mirrored cupboard with drawers for your storage needs, and a mirrored dresser to help you look your best. A TV is also available in the room for your entertainment. 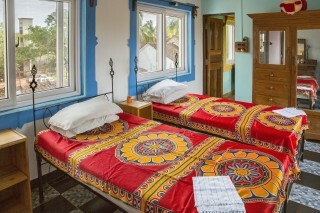 The walls are painted in a light shade of blue and a deeper blue has been used for highlights. 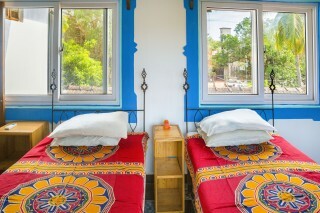 The room is cheerful and well ventilated, thanks to the big French windows that lead to the balcony on one side and two other windows on the opposite wall, above the beds. 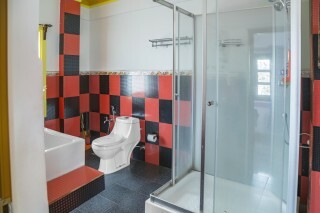 The bathroom, with a step-in shower enclosure, is tiled in red and black, and is well appointed with modern sanitary ware. Tivim Train Station is 19km away. Goa International Airport is 38km away. Bus Stand, Kochi is 43km away.